Adobe is one of the most profitable companies on the planet turning over a massive 5.8 Billion USD in 2016. The turnover in 2015 was 4.8 Billion. The companies income rose by 21% after the introduction of the Creative Cloud subscription products such Lightroom CC et al. This week Adobe announced the long-awaited new and faster Lightroom 7. The long and short of it is that as a business model for holding photographers to ransom to view and process their own pictures Adobes latest moves are totally brilliant for making money. Lightroom 7 in all its various guises will be cloud-based. That means that all your pictures you currently hold on local hard drives will have to be uploaded to the Adobe Cloud. If you have an internet connection that will allow upload say a catalogue of 3.5Tb of pictures at 0.5mb/sec as mine is that might be fine. If you trust the vagaries of the internet with your pictures, I do not so, I will not give life’s work to be controlled by anybody but me. What about the cost of continuing to use Lightroom 7 even if the internet works and is fast enough? The Adobe published cost for up to 5Tb of data (75,000 pictures) of cloud storage and access to my own pictures is $50 per month. If I take 10,000 pictures per year, as Megapixels rise the cost of storing accessing will also rise above the already extortionate $50 pm. So this is an ongoing issue, that will not go away. Now is the time to make a clean break with Adobe and look for another Raw Image Processor. I feel Adobe has let me down as a loyal customer along with millions of others. Bye bye Adobe, it could have been so much better thatn this mess. As a move to look to find a viable alternative to Lightroom CC yesterday I downloaded a 30-day trial version of the Phaseone Capture One 10 Software. Its very early days yet to becoming proficient with the workflow. This is not a cheap option a licence for C1 software is a single non-subscription payment of e 335 inc VAT. One of the best things I have found is that the User Interface tools can be moved around and placed in the best order for workflow. Lightroom had all the right tools but in the wrong place. It took about 4 hours to import my Lightroom Catalog into a Capture One Catalog. Hot Hint – if you are thinking of moving to C1 double check first that your cameras are supported – see here for more details. Please give your feedback if you are using Capture One particularly if you a Fuji Camera. A much more cost-effective option may be to use the Affinity Photo 1.5 Software from Serif. At a mere £49 you get the most useful bits of Photoshop or so it appears. This would be an option to replace Photoshop. I have just downloaded a free 10-day trial I have not opened yet so we will have to see how user-friendly it is. I see from a quick search that Affinity Photo has a Split Tone Balance Slider and I can use Silver Efex with it so I am beginning like it already! Again any useful comments are most welcome. 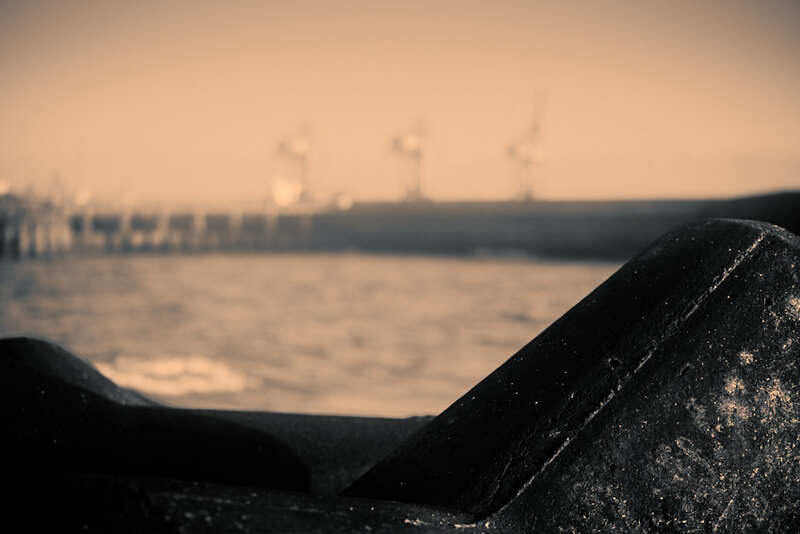 The picture above was taken at Port Talbot Docks before a talk to Cymru Mono this year. It has been processed solely in Capture One. As you know I do a lot of split toning and C1 does not have a Split Toning Balance Slider like Lightroom. As an alternative, I could have opened the picture in Silver Efex Pro 2 as a plugin to C1 and done the toning with a Balance Slider there. Oh dear oh dear how shocking is this …. very disappointing and I only just downloaded the new Lightroom Classic & CC updates to iMac and MBP last night, I was so impressed with the interface on both and how fast they were but now after reading the article link Andy included thank you (interesting reading and comment) it looks like my digital photography tools are going to cost me eventually at least another $50 a month for forced image storage in the cloud eventually ….. when Classic is axed which it will be for sure……. This is OUTRAGEOUS! Lightroom CC or as one comment said, is really Lightroom credit card. How true. Adobe are holding us to ransom and I don’t like it and I shall be leaving which is a terrible shame because for the last three or four years I’ve been a subscriber of Adobe CC photography Plan and have enjoyed the whole experience for £10 a month it was reasonable and affordable and for me as a semiprofessional photographer I was willing to pay but looking at the future to come it’s probably going to end up costing me about $60 plus a month and that I can’t afford so I shall be leaving and I should be looking for alternatives right now, what a backward step Adobe and how very disappointing greed greed greed . 🙁 🙁 I am fuming! The big problem is asset management. C1 doesn’t, yet at least, match LR in this respect and is rather expensive in comparison. As I’ve only recently upgraded my camera body, I’ll stick with LR6 and let the marketplace shake things down for a while before deciding what to do. It won’t involve subscriptions and the cloud though…. According to lightroomqueen.com, 6.13 is coming on 26 Oct.
No need to rush into a decision though. LR6 will do all I need for the next year or two at least – although it would be nice to get some of the new features in the CC versions, I can live without them. I can see that in 1-3 years, a new camera body or computer OS or something else will mean I’ll have to change…. I’m hoping that by then an Adobe competitor will have come up with a good alternative. Andy – Is it not possible to stay with Lightroom Classic which Adobe are claiming they will continue to support and thereby avoid the Cloud storage cost? I was a long time user of paint shop pro when Jasc owned it. .. from v3 to v9 as I recall. A very capable program but more of a competitor to photoshop than LR. Then Corel bought it and made it prettier but less usable (in my view at least). I abandoned it after buying X3 (v13). 1. Edits are applied directly to the image. Once you’ve saved your changes, they’re baked into the file. 2. It doesn’t do asset management at all. It’s possible that later versions than I have used might address these to some extent, but I doubt it. Like yourself, I gave up Adobe Cloud membership late last year upon subscription renewal. Tried several programs (on Trial) settled on Affinity Photo, most tool layouts are same or similar to Adobe. My only gripe is support. An example is batch processing, whenever I try to undertake this the program crashes have followed video on ‘you tube’ but to no avail, even contacted support direct who directed me back to video’s. Apart from that I like the program am trailing the new version of Lightroom, must agree it is quicker but do not see any advantage to change back.